Our mission is handcrafting and curing authentic European Salumi and fine meats, we blend the flavors from the Mediteranian for all our gourmet salamis, following the finest traditions, using the best Berkshire pork and all-natural meat. Our Berkshire is 100% purebred. A first time in Los Angeles County. The old and traditional way to raise hogs produces an outstanding flavor, aromatic and quality salumi. The food we eat should delight us every day, we want to be part of your every day delight! Pascal J-F Besset, Founder has been involve in the Southern California food scene for many years. Mostly he has been behind the scenes as a wholesale distributor, introducting excellent products to many of the region’s top Chefs and Hotels. Coming on the top of his classic training, His experience honed his palate and established him as a leading resource for gourmet products. Pascal learn the Charcuterie in the South of France, Monte-Carlo, Corsica and Paris with a Silver Metal M.A.F in Charcuterie Bernard Broust, and Mr. Langlois M.O.F in Charcuterie at Gaston Lenotre School, His father’s long time friend Cesar Merlino, Chef and Maitre Charcutier in the French Alpes, was his first Master and knew how to share his passion. Pascal was Chef and made his kitchen apprentissage in six 5 Stars Hotel, two properties classified top 10 in the World. He has sourced only the finest ingredients for his signature line of Salumi. Each recipe has been refined by him and he handles the production in small batches ensuring quality and consistency for your pleasure. 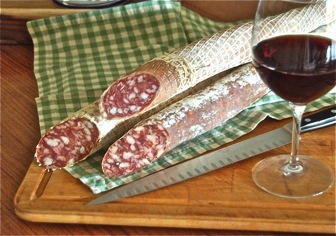 The Rosette, a Natural FRENCH Country style Salami made with Berkshire Pork Meat. 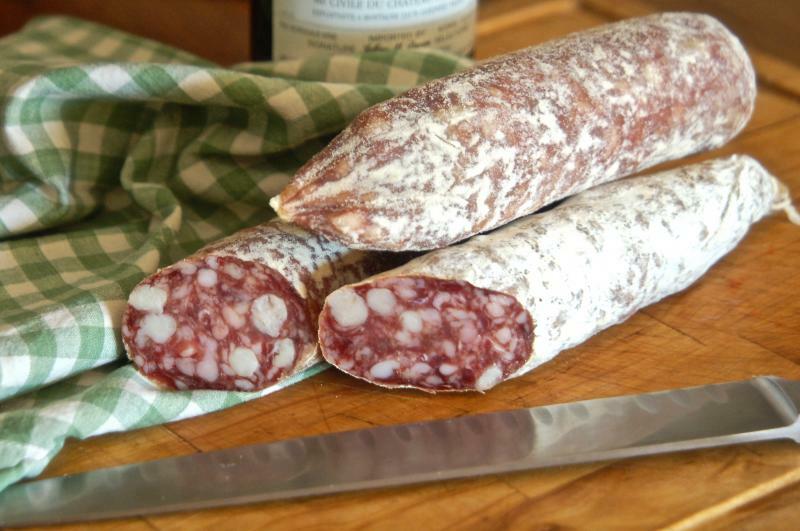 This is one of the most classic dry cured French sausage called Rosette de Lyon, it’s all Natural, with a sweet middle flavor, a little bit of garlic and white wine. Perfect with a good Burgundy with a great Baguette and some cornichons. 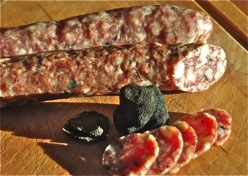 Black Truffle Salami made with Berkshire Pork Meat. 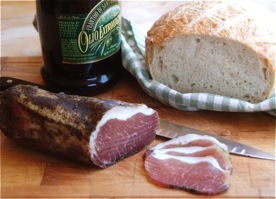 This unique Black Truffle Salami is made with the most tender and sweet Berkshire meat and 5% Black Winter Truffle. The little saltyness combined with the Red Wine, Armagnac and Spices have a inforgetable taste. Duck Salami 100% Duck cage Free Certified. 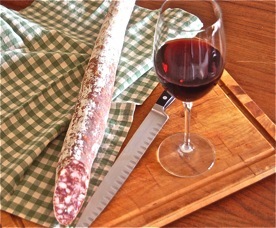 Made with 100% duck meat cage-free certified, Rich French style Duck Salami, with Red Wine, and Black Peppercorn, with a tender bite. Typical spicy Italian sausage, dry cured fermented, with a little Fennel, Red Wine, Grappa and Hot Spices, Ages for about 3 months. Perfect with a nice Pinot Grigio. 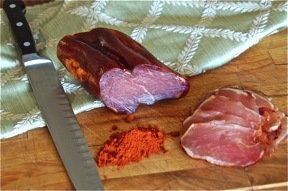 It’s the house classical Salami recipe, with all the flavor form the North of Italy. Coarsely grounded, with a mild peppery and wine flavor, perfect with melon and figs. 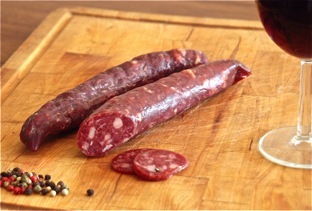 Venison salami is a mixture of Venison and Berkshire pork meat, seasoned with red wine, Juniper Berries and Black Peppercorn. It’s unique flavor goes very well with a rich red wine. Dried Cured Duck Breast. 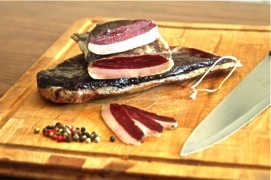 Duck Prosciutto, made with a cage-free certified duck breast air-dried to perfection. Serve with melon, salad, or charcuterie plate. Enjoy the same way as prosciutto. A classic dry-cured finest Berkshire pork -loin, massaged with typical imported Spanish spices and slowly air-dried. Very tender and full of flavor. Perfect for tapas. 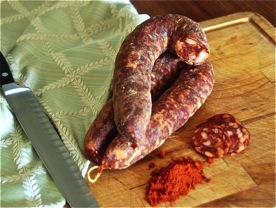 Made with 100% Berkshire Pork Meat, this very flavor-full Dry-cured Chorizo is a little spicy, with a very tender bite. Perfect for tapas with a cold Sangria. Increbibly tender and tasty dry-Cured Berkshire pork loin, well massage before drying, with herbs and spices, absolutly delicous delicate flavor. Stop by Cheese & Crackers today to try a sample of any of the Angel Salami's. These handcrafted, old world meats are a slow food treasure. 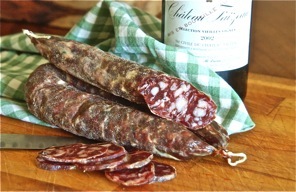 We love Salami, and currently carry over 75 meats to compliment our extensive cheese and chocolate collection. Stop by anytime to try a sample of our stunning old world meats, handcrafted with love.